The DreamWorks Spooky Stories has a nice collection of shorts that the entire family will enjoy. The Blu-ray offers up excellent audio and video transfers but the features have much to be desired. While most of these were previously available on DVD, it’s still nice to have them all on one disc. This “DreamWorks Spooky Stories” release contains five Halloween-inspired shorts that have been previously released on DVD or shown at some venue. First, “Scared Shrekless” and “Monsters vs. Aliens: Mutant Pumpkins from Outer Space” came out in a Halloween Double Pack back in September 2011. 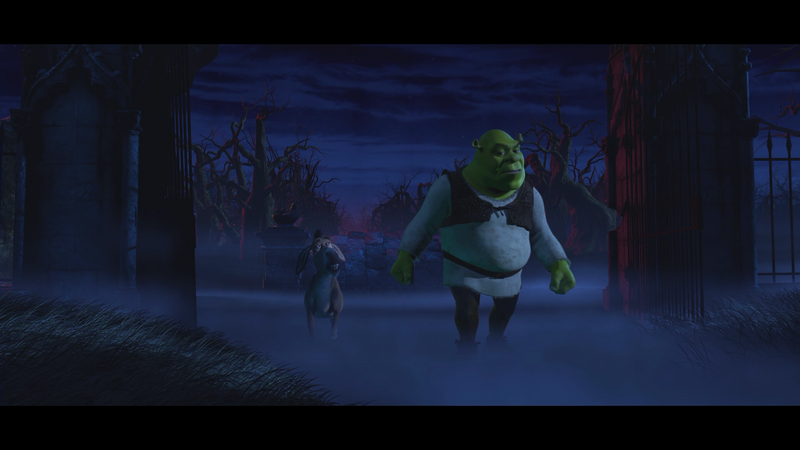 “Scared Shrekless” – Halloween is Shrek’s favorite holiday, but instead of the usual tricks or treats, Shrek (MIKE MYERS) ups the ante and challenges the gang to spend the night telling scary stories. The last one to be Scared Shrekless wins. Also included is the Shreked-out parody of Michael Jackson’s ‘Thriller’. 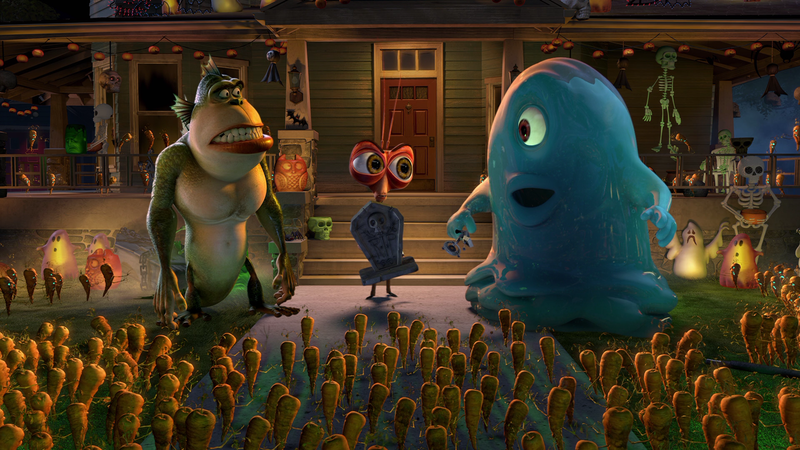 Monsters vs. Aliens: Mutant Pumpkins from Outer Space – The gang is back as special operatives dispatched to investigate a mysterious alien presence on Halloween. As the night unravels the innocent-looking pumpkins are revealed for what they really are: mutant aliens! Luckily the Monsters are there to smash the mutants’ wicked scheme to take over Earth. 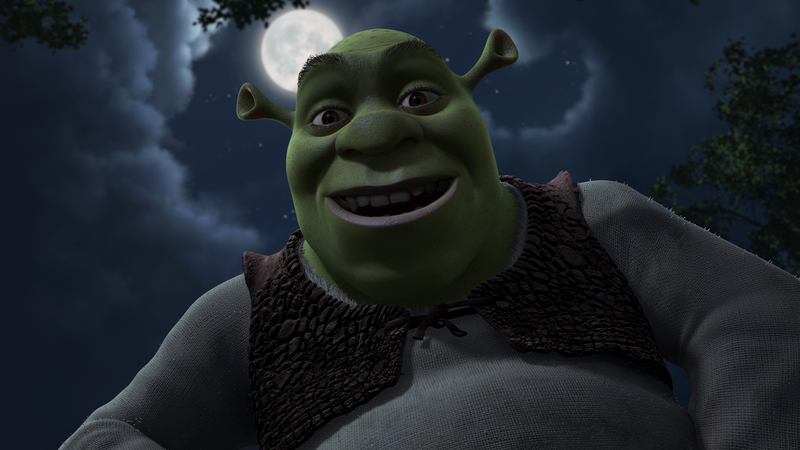 In the section called “Shrek’s Thrilling Tales” which contains three shorts: “The Pig Who Cried Werewolf”, “Night of the Living Carrots” (takes place in the aftermath of “Mutant Pumpkins from Outer Space) and “The Ghost of Lord Farquaad”. This was originally released in August of 2012. Both of these specials aired on NBC, one in ’09 and the other in ’10, before Halloween and featured many of the voice talents from the feature films. Having watched Shrek the Halls, I enjoyed these holiday specials as they’re a good and fun time and only last 25 minutes or so. Sure, the stories of course are weak but the humor is good for both kids and adults. The Monsters Vs. Aliens special, it finally made its way onto DVD after a couple of years with the only way to view it being on Torrent sites which, from what I read (seriously), the picture and audio were not the best. In regards to the specials themselves, I have a preference toward Scared Shrekless because I’m far more familiar with the franchise than I am with Monsters Vs. Aliens, but even so, the latter is still funny. Same goes for the Shrek special and whether or not you’ve seen either of their theatrical film counterparts, both are enjoyable if not passable entertainment. Night of the Living Carrots Pop-Ups is a joke pop-up trivia track. 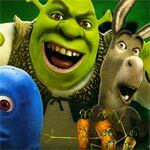 World of DreamWorks Animation allows the user to check out music, trailers, etc for the various DWA films. Also included is a retail DVD Copy. While all these animated shorts were previously released on DVD, they make their debut on Blu-ray in a vibrant 1080p high-def transfer. Each, except for one, are presented with a 1.78 widescreen transfer (“The Ghost of Lord Farquaad” is 2.40) and look great with bright colors and adequate detail levels. For whatever reason, DreamWorks Home Entertainment has given these shorts a Dolby TrueHD 7.1 track. It’s certainly not bad but I wonder if it’s put to good use given the source material (a couple originally aired on television). In any case, the track is good and fairly robust. Overall, the DreamWorks Spooky Stories has a nice collection of shorts that the entire family will enjoy. The Blu-ray offers up excellent audio and video transfers but the features have much to be desired. While most of these were previously available on DVD, it’s still nice to have them all on one disc.